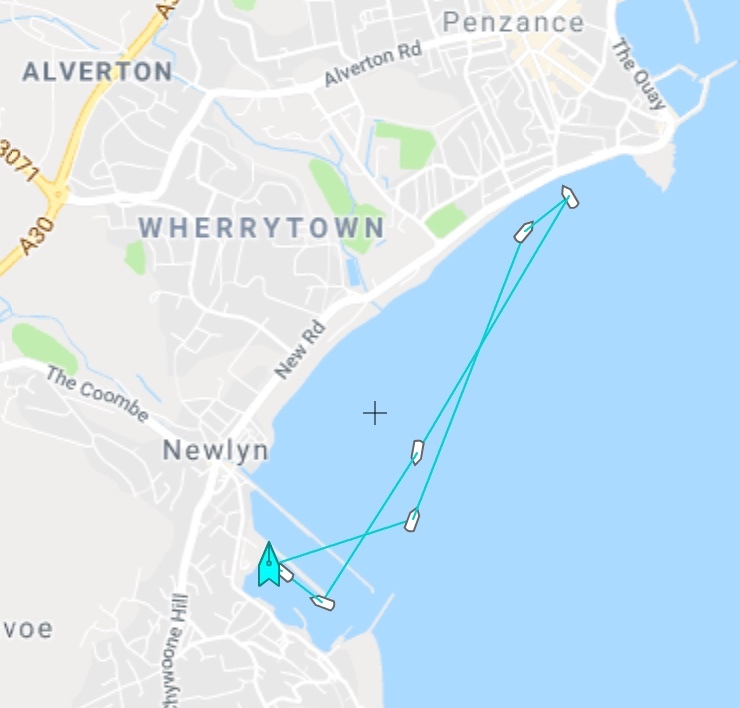 09/04/19 19:04 Assist a 32-foot fishing vessel, with two persons onboard, that had suffered engine failure ALB TBD Vessel towed into Newlyn harbour. 25/03/19 10:41 Reports of a dog in difficulties in the sea near Marazion ILB NNE 4-5 The dog made it back to shore. The lifeboat was then stood down. 10/02/19 16:24 Windsurfer in difficulty off Marazion ILB WNW 7-8 Windsurfer assisted to shore by nearby fellow windsurfer. ILB stood by, casualty confirmed as OK.
25/01/19 13:25 Swimmer in difficulty near Praa Sands ILB TBD ILB stood down shortly after launching. Casualty confirmed as OK.
10/01/19 15:12 Medical evacuation of an injured person at bottom of cliff near Mullion ILB TBD Person taken from cliff to Mullion harbour and handed over to Ambulance. 07/01/19 17:06 Search for a vulnerable missing person near Perranuthnoe BOTH WNW 4 Person found by Police, Search called off. 01/01/19 13:41 Shoreline search after clothing spotted in sea ILB N 2 Clothing recovered, search carried out, nothing further found. 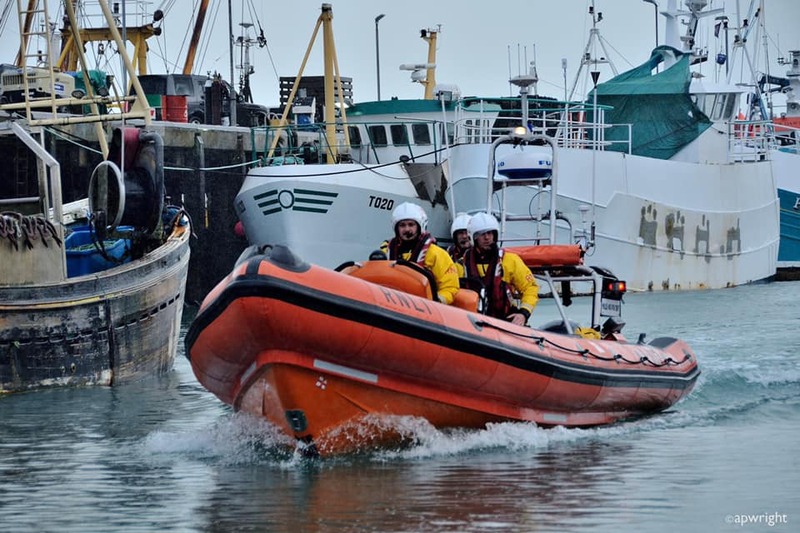 At 3.02pm on Sat 30th March, following a tasking request from the Falmouth Coastguard Operations Centre, the Inshore lifeboat ‘Mollie and Ivor Dent' launched on service from Newlyn. A report had been received that two people on a double kayak had capsized off Church Cove. Due to the northerly breeze the kayak had blown away from them. 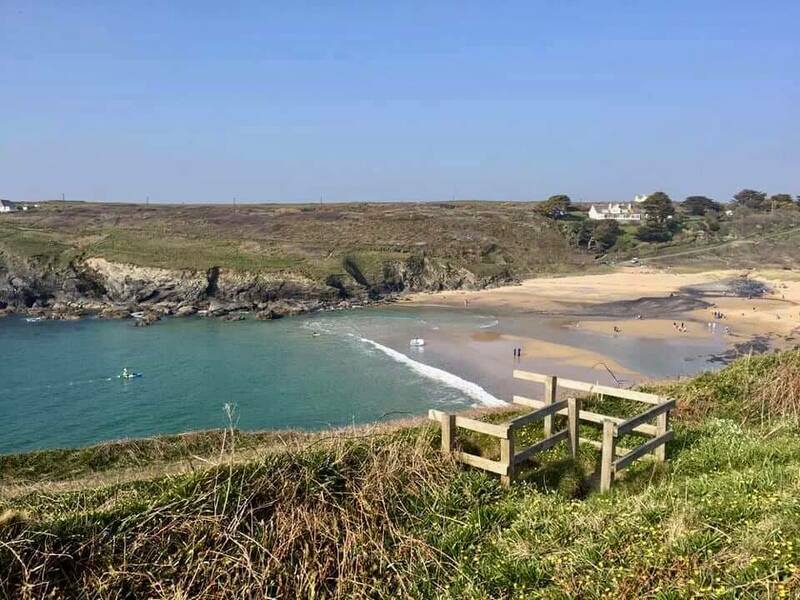 Thankfully they managed to swim to rocks to the north of Poldhu Cove, where one of the casualties clambered over rocks to Poldhu Beach and raised the alarm. 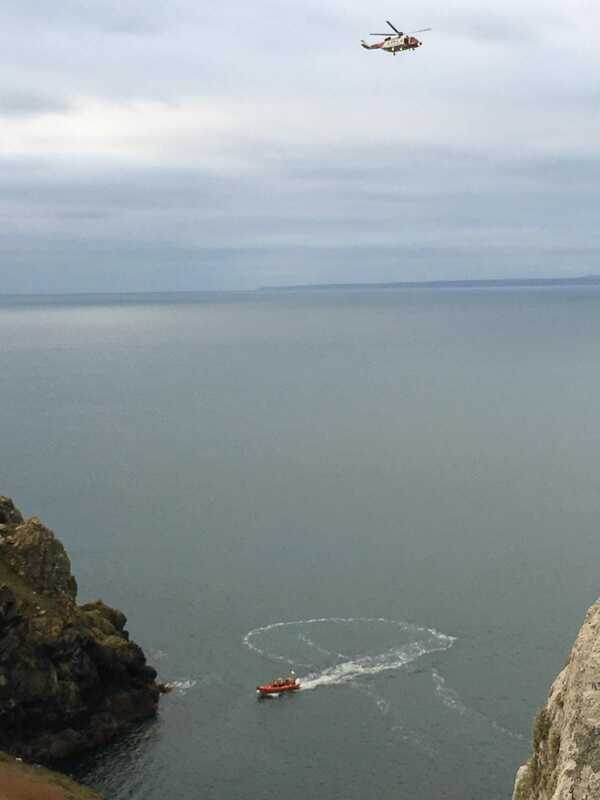 At 3.22pm the Penlee Inshore lifeboat arrived on scene, the crew quickly located the casualty and transferred her to the lifeboat. They then retrieved the kayak and a paddle that had been recovered by two paddle boarders. 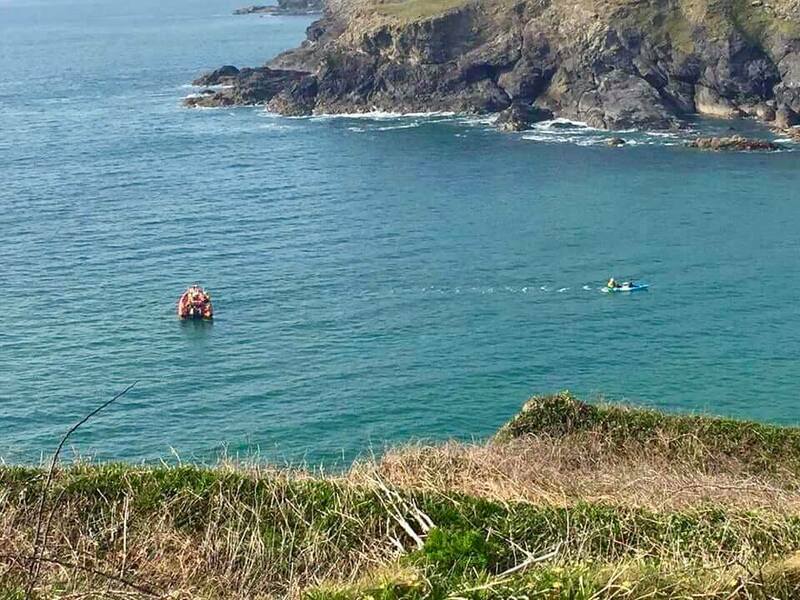 The lifeboat crew liaised with Mullion Coastguard Rescue Team, who had also been tasked and were on scene, and the casualty plus kayak were landed safely on Poldhu Beach. Penlee ILB headed back across the bay arriving back in Newlyn at 4.15pm. Crew - Andrew Wood, Will Treneer, Tom Matson & Marcel Le Breton. Weather - North 3-4 slight sea. Penlee all-weather lifeboat ‘Ivan Ellen’ launched at 7.34am on Tuesday 26th March at the request of the Falmouth Coastguard Operations Centre. 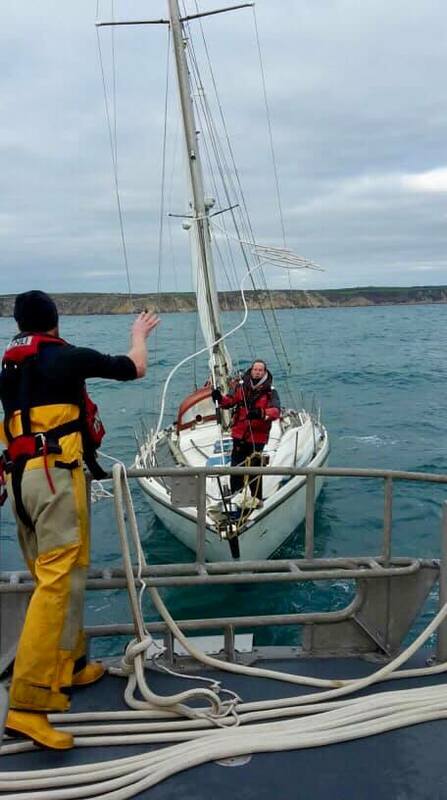 A 28-foot yacht, with one person onboard, had suffered engine failure five miles SE of Newlyn. With no wind at all the yacht was unable to make any headway. 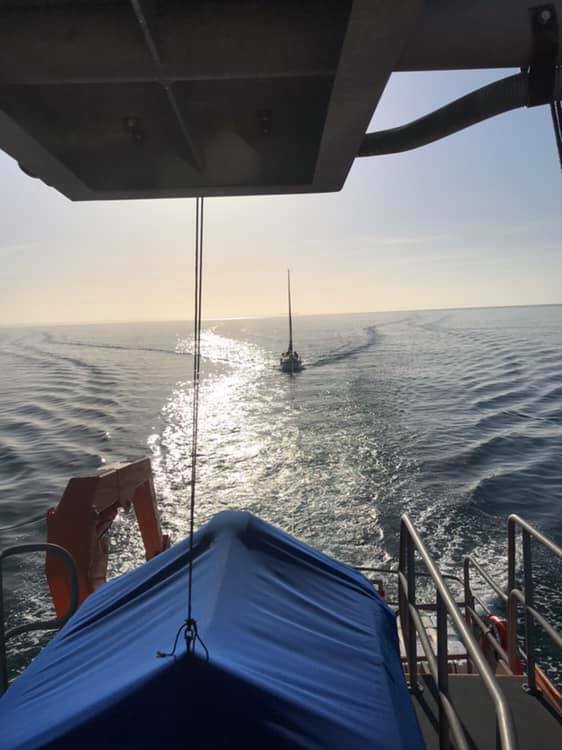 In very calm sea conditions the Ivan Ellen quickly arrived on scene, put a crewman on board to help retrieve the anchor, then towed the yacht back to Newlyn harbour arriving at 9.00am. Crew - Patch (Cox) Mechanic Tony Rendle, Andrew Wood, James Roberts, Sam Kent, Amy Smith & Tom Matson. Penlee Inshore Lifeboat 'Mollie and Ivor Dent' launched from Newlyn at 10:41am on Monday 25th March. 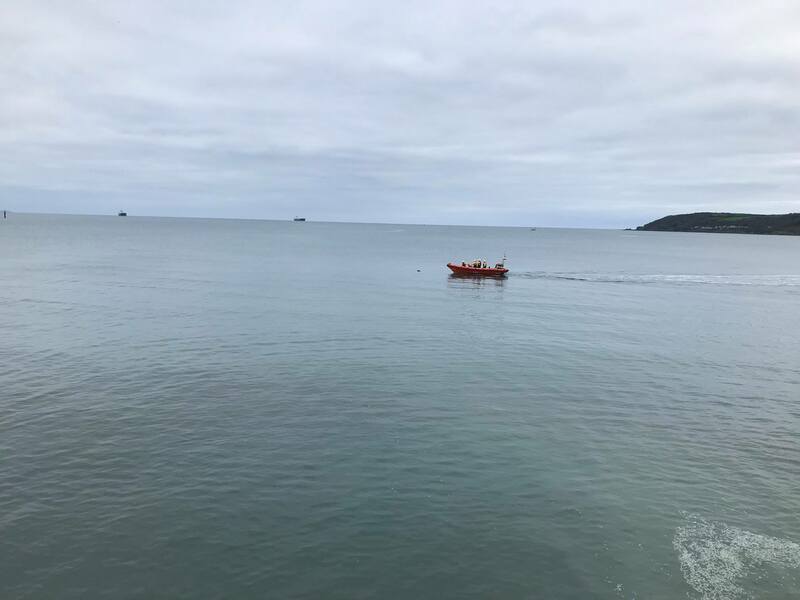 Falmouth Coastguard Operations Centre received reports of a dog in difficulties in the sea near Marazion and requested the launch of the Inshore lifeboat to assist in its safe recovery. Penzance Coastguard Rescue Team were also tasked. As the Mollie and Ivor Dent sped across the bay reports came in that the dog had thankfully made it back to shore, to the delight of its worried owner. The lifeboat was then stood down and returned to station. Weather - NNE 4-5 slight sea. Whilst on a training exercise on Sunday morning, the inshore lifeboat ‘Mollie and Ivor Dent’ were diverted to Porthcurno to reports of a surfer caught in a riptide - thankfully their services were not required and the surfer is ok. Back to crew training in the bay! During the early hours of this morning the crew pagers sounded and the all-weather lifeboat ‘Ivan Ellen’ was tasked to launch by HM Coastguard Operations Centre to give assistance to our colleagues at Sennen Cove Lifeboat Station. 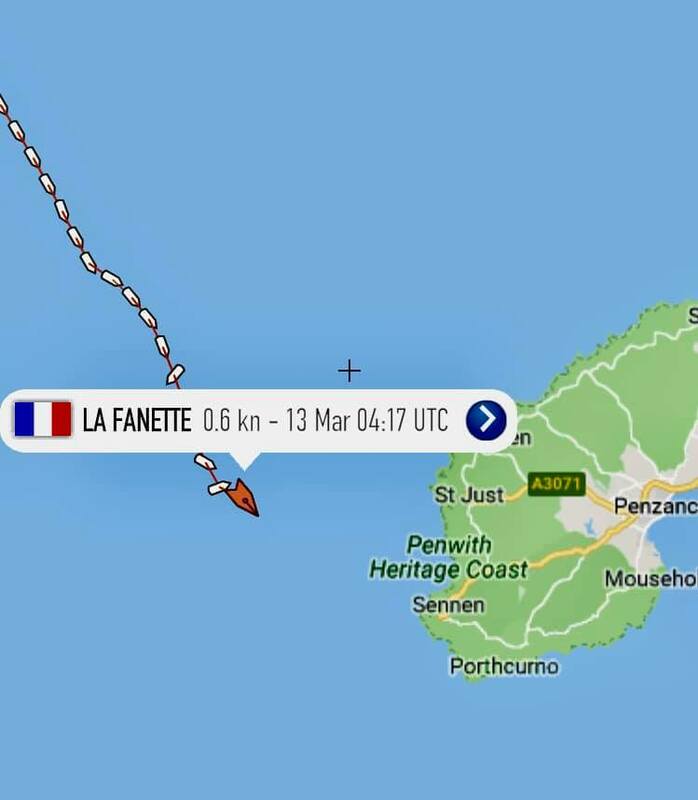 HM Coastguard was alerted at around 10pm on Tuesday night to the 24 metre French registered fishing vessel, La Fanette which had suffered engine failure. Another fishing vessel went to assist and HM Coastguard requested the launch of Sennen Cove RNLI lifeboat. Despite atrocious weather, Sennen Cove Lifeboat launched but due to 5-6 metre waves on scene and storm force winds, it was impossible for either the fishing vessel or the lifeboat to establish a tow with La Fanette. The six crew on board were airlifted from the fishing vessel by Newquay Coastguard Rescue Helicopter. HM Coastguard continues to monitor the drifting vessel. Crew - Coxswain Patch Harvey, Mechanic Tony Rendle, David Pascoe, Ben Keogh, Andrew Wood, Jack Shannon, and Dan Sell. At 4.50pm this afternoon the all-weather lifeboat ‘Ivan Ellen’ received a launch request from Falmouth Coastguard Operations Centre. A 35-foot local fishing vessel, with two persons on board, was disabled and drifting 6 miles SE of Newlyn due to a fouled propeller. 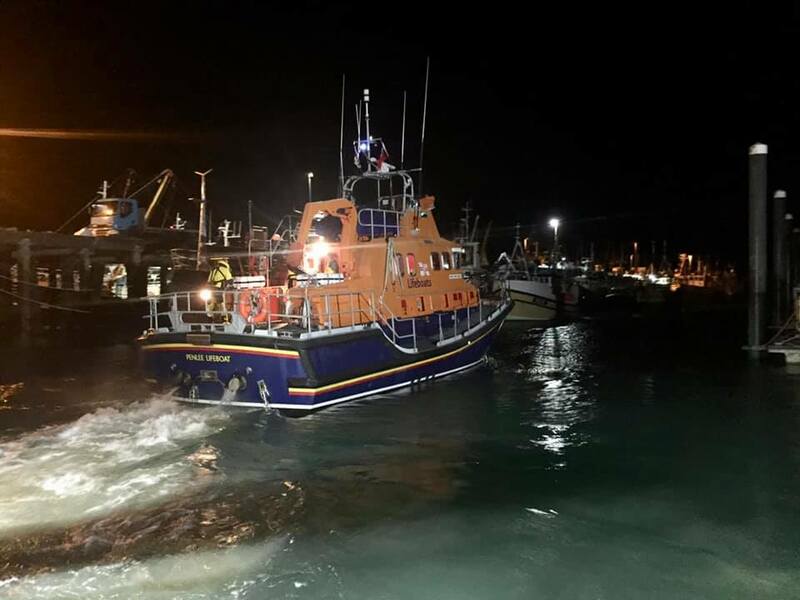 The Ivan Ellen launched immediately and arrived alongside the fishing vessel in 20 minutes, a rope was attached and the lifeboat towed the vessel towards Newlyn. It was rafted alongside outside the harbour entranc...e then towed to a quay berth. The ‘Ivan Ellen’ was washed down and ready for service again at 6.30pm. Weather - WNW 3-4 mod sea 2m swell. Crew - Patch (Cox), Tony Rendle, Andrew Stevens, Adrian Bick, Amy Smith, Andrew Wood & Marcel Le Bretton. Penlee Inshore Lifeboat 'Mollie And Ivor Dent' launched at 16:26 this afternoon after Falmouth Coastguard received reports of a Windsurfer in difficulties off Marazion due to strong winds. Penlee Inshore Lifeboat launched immediately and arrived on scene in five minutes, thankfully another Windsurfer nearby saw the person in difficulties and helped them safely back to the Beach while Penlee Inshore Lifeboat stood by. Our colleagues from Penzance Cliff Rescue Team also attended in case medical attention was needed. Weather WNW 7-8 mod sea 2m swell. A further 10 crew responded not a bad effort as the pager sounded during the England rugby match. At 2.15pm this afternoon the all-weather lifeboat ‘Ivan Ellen’ and her volunteer crew launched on service from Newlyn. 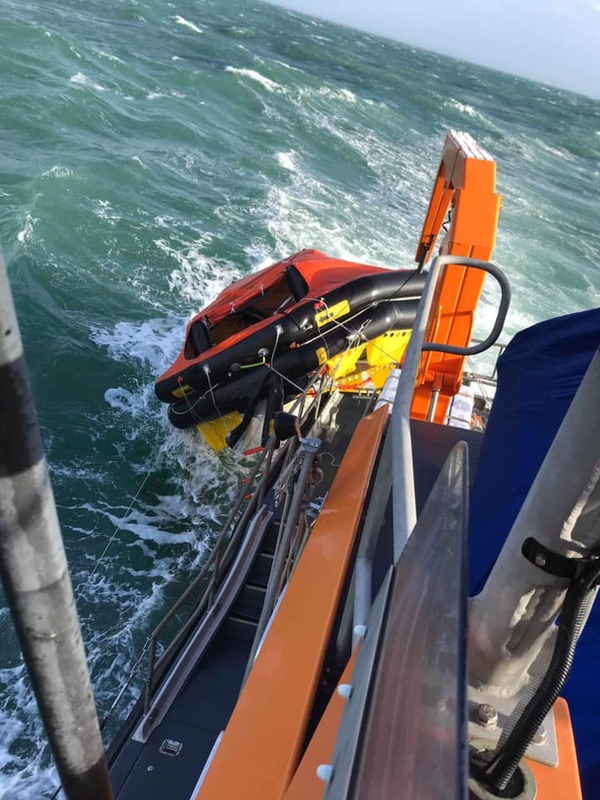 A third party report had been received from a member of the public, who was walking on the coast path near Lamorna, and had spotted a life raft drifting off shore. Falmouth Coastguard Operations Centre tasked the lifeboat to launch immediately and conduct a search of the area in question. The Ivan Ellen quickly located a 24 man fully equipped life raft 2.5 nautical miles SE of Newlyn. It was full of water which made recovery quite difficult. 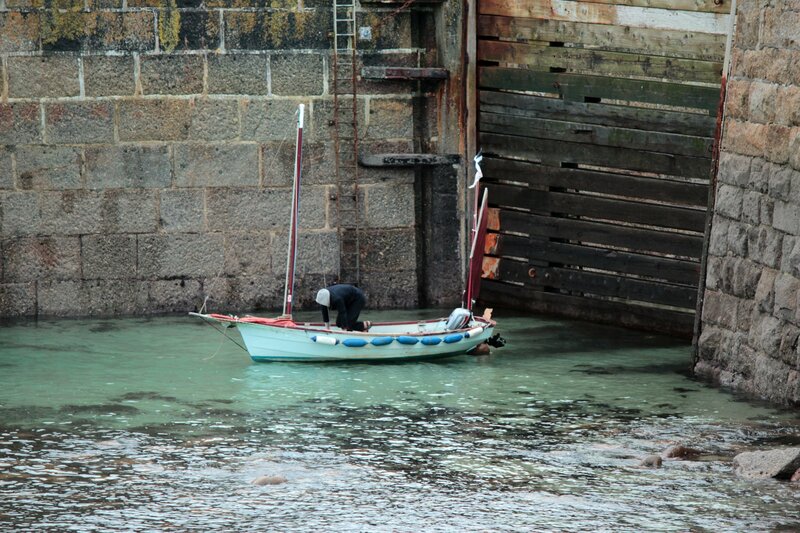 After several attempts the crew managed to get the life raft alongside and it was conveyed back to Newlyn. The life raft was identified as coming from HMS Mersey. They had previously reported its loss to the Falmouth Coastguard Operations Centre. HMS Mersey is the youngest of the original batch of River class patrol vessels. She patrols the waters of the UK and up to 200 miles in the Atlantic ensuring that fishing boats and trawlers stick to internationally-agreed quotas. 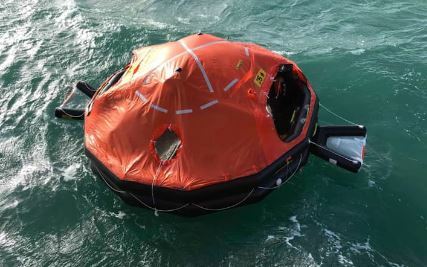 The life raft will be collected by the Royal Navy early next week. Weather - Stormy with squally showers, SW Force 7-8, rough sea. Crew - Coxswain Patch Harvey, Mechanic Tony Rendle, Marcel Le Bretton, Jack Shannon, Andrew Stevens, Amy Smith & Will Treneer. 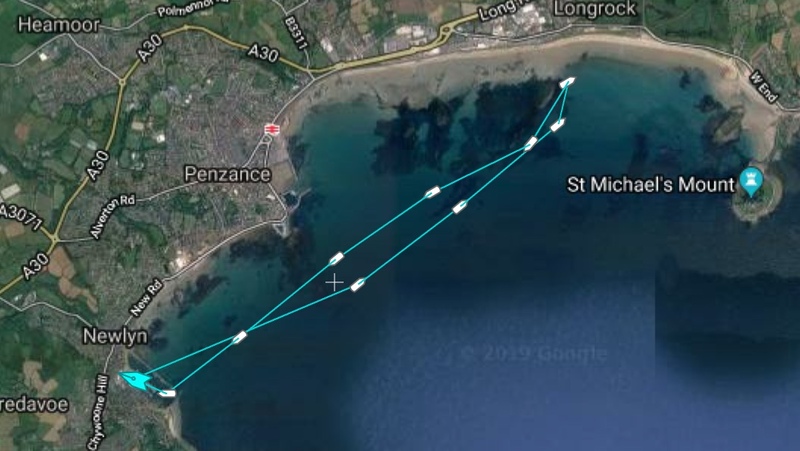 Earlier this afternoon Coxswain Patch Harvey received a telephone call from local police Officer, PC Craig Neal (also a crew member) requesting the immediate assistance of both lifeboats at St Michael’s Mount. A male in his early 30’s had taken far too much Insulin and had collapsed on rocks at the waters edge to the south side of St Michael’s Mount. The launch request was cleared with Falmouth Coastguard Operations Centre and the crew pagers sounded at 2.28pm - by 2.34pm the Inshore lifeboat ‘Mollie and Ivor Dent’, and the all-weather lifeboat ‘Ivan Ellen’ were speeding across Mount's Bay, a fantastic response time by both crews. 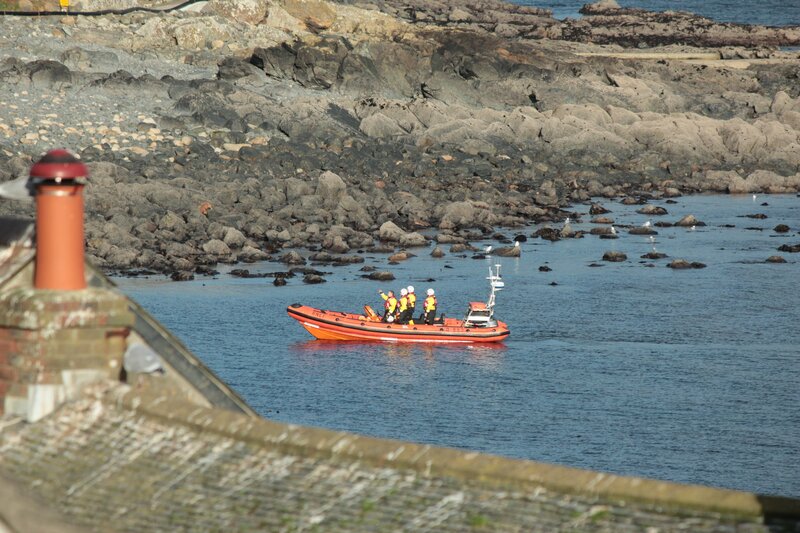 On arrival, the Inshore lifeboat went in close to the rocky shore and the casualty was carried safely onboard. 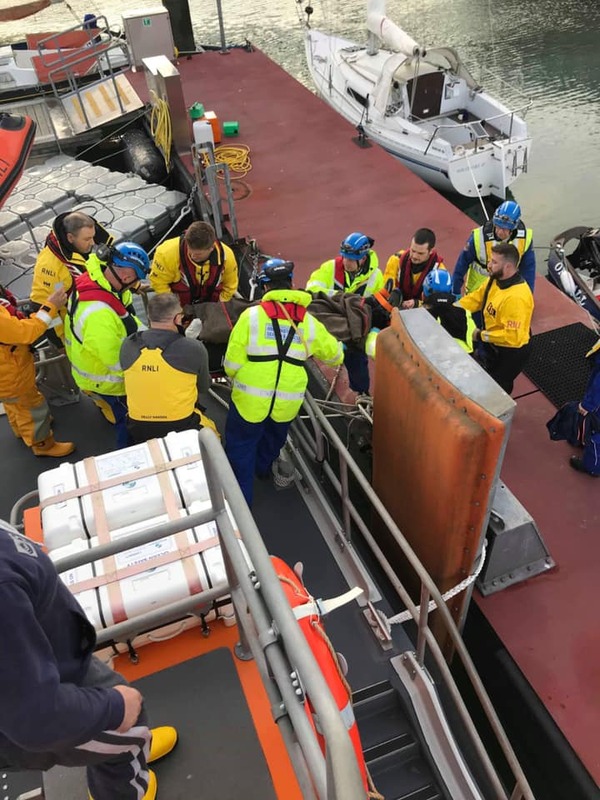 He was immediately transferred over to the Ivan Ellen lifeboat where he was given oxygen and wrapped in blankets - at this time the casualty was unresponsive. An ambulance was requested and both lifeboats immediately returned to Newlyn. 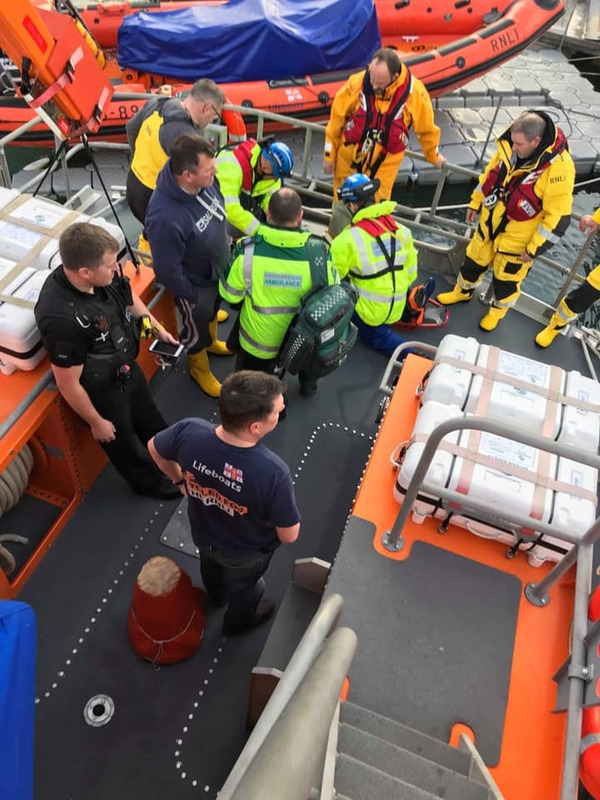 On arrival they were met by members of the Penzance Coastguard Rescue Team and a paramedic from the South West Ambulance Trust - the casualty was treated onboard the lifeboat for about 20 minutes before being carried ashore to an awaiting ambulance. As always team work at its best! ILB Crew - Helm James Roberts, Paul Boulton, and Dan Sell. ALB Crew - Coxswain Patch, Mechanic Tony, David Pascoe, Rich Nicholls, Adrian Bick, Jack Shannon and Jason Ward. Weather - WNW Force 5-6 gusting. The crew were still in their dry suits from previous shout and had just returned to the lifeboat station when their pagers sounded again. Falmouth Coastguard Operations Centre tasked the Inshore lifeboat to proceed to Mullion to assist a person that required medical assistance. The casualty was positioned at the bottom of cliffs about 10-feet above sea level on a low tide. Mullion Coastguard Rescue Team and officers from Devon & Cornwall Police were already in attendance. Coastguard Rescue Helicopter ‘Rescue 924’ was scrambled and arrived on scene at the same time as the ‘Mollie and Ivor Dent’. The lifeboat and Rescue 924 crews quickly assessed the situation, and the most appropriate/safest way to extract the casualty. In very shallow water the ILB went in close to the shore and the crew safely carried the casualty onboard. They quickly transferred him to Mullion Harbour where the lifeboat crew carried him to an awaiting ambulance. Rescue 924 remained on scene until a safe transferral had taken place. Job done the Inshore lifeboat returned to Newlyn and was made ready for her next service. Crew - Helm James Roberts, Andrew Wood, Marcel Le Bretton and Tom Ritchie. At 1.51pm the Penlee ILB was tasked by Falmouth Coastguard Operations Centre to check out a 5-metre sailing yacht thought to be adrift with no one onboard off Mousehole. The vessel was quickly located at anchor between Mousehole Harbour and St Clements Island - it’s owner was located safe and well having a pint in the Ship Inn Mousehole! False alarm reported with good intent. Crew - Helm Will Treneer, James Roberts, Marcel Le Bretton, and Andrew Wood. At 5.06pm this evening both Penlee lifeboats launched from Newlyn at the request of Falmouth Coastguard Operations Centre. They were tasked to assist the Devon & Cornwall Police who were searching for a vulnerable missing person near Perranuthnoe. 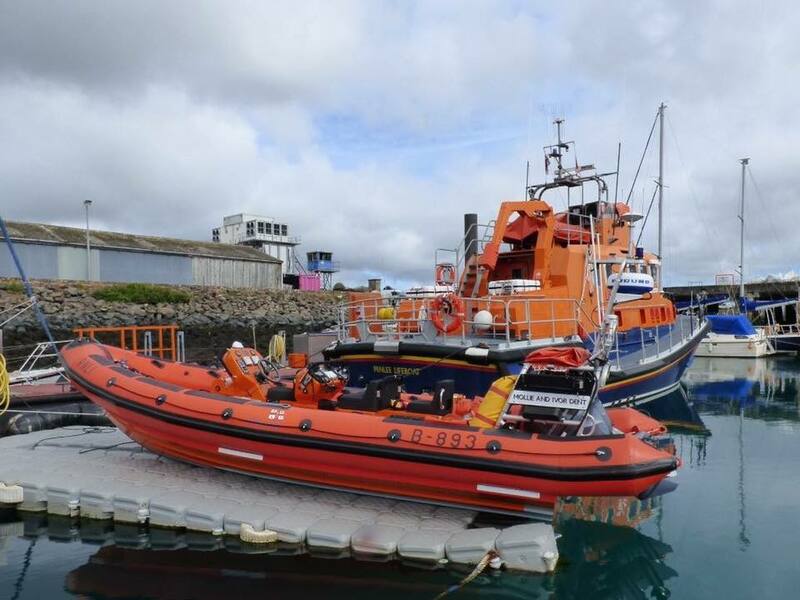 The Mollie and Ivor Dent & Ivan Ellen lifeboats were asked to conduct a shoreline search to locate, and possibly recover the person. Penzance Coastguard Rescue Team were also tasked to help search the area. As both lifeboats approached the search area the person was located safe and well on Perranuthnoe beach by the police. All units were stood down. ALB Crew - Coxswain Patch Harvey, Mechanic Tony Rendle, Ben Keogh, Andrew Stevens, James Roberts, Jason Ward, and Rich Nicholls. ILB Crew - Dave Pascoe (Helm), Andrew Wood, Dan Sell, Marcel Le Bretton. At 1.02pm and at the request of Falmouth Coastguard Operations Centre, the all-weather lifeboat ‘Ivan Ellen’ and her volunteer crew launched from Newlyn. 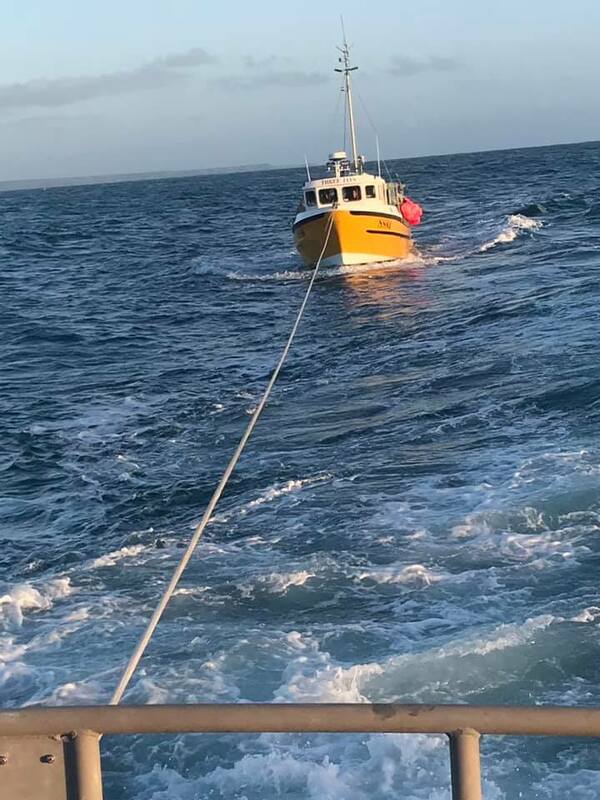 They were tasked to give assistance to a 44-foot sailing ketch ‘Greyhound’, with three persons onboard, that had suffered engine problems one-and-a-half nautical miles SW of Gwennap Head. The ‘Greyhound’, which was on passage from Swansea, had been at sea for 20 hours and was struggling to make any headway towards Newlyn. The Ivan Ellen arrived on scene at 1.30pm and the yacht was immediately taken under tow. She was taken back to Newlyn, rafted alongside just outside the harbour, and brought safely through the gaps to a berth on the pontoon at 3.00pm. The Ivan Ellen lifeboat was washed down and made ready for her next service. From St Clements Island just off Mousehole, to the harbour gaps at Newlyn, the lifeboat was accompanied by a pod of dolphins. Crew - Deputy Coxswain David Pascoe, Mechanic Tony Rendle, Ben Keogh, Andrew Wood, Amy Smith, Jason Ward and Tom Matson. Weather - SSE Force 2-3, slight sea. We were tasked by Falmouth Coastguard Operations Centre at 1.41pm at the request of the Penzance Coastguard Rescue Team who had received a report of possible clothing in the sea off the Penzance Promenade by Devon and Cornwall Police. The Penzance Coastguard Rescue Team were quickly on scene and they established the location of the clothing, out of their reach they request support from the Inshore Lifeboat ‘Mollie & Ivor Dent ‘ to recover the clothing in the sea near Penzance Promenade and search the area to make sure no one required assistance. The clothing was found to be a child’s jacket and with nothing further out of the ordinary in the area, the Police were happy that the jacket had been lost from the shore. Crew. Dave Pascoe, Tom Matson, Andrew Wood & Dan Sell. Weather Light Northerly wind slight sea.